An excellent option, especially if you're a student with no credit file and no social security number. The Deserve® Edu Credit Card is an excellent option for student who lacks a social security number (SSN). The card can help this group of people get a first credit card, and foot in the door of credit bureaus so they may begin building out their credit file. The Deserve® Edu Credit Card is especially useful for international students, who frequently struggle to get a regular U.S. credit card because they lack the necessary credentials in this country. How Does the Deserve Edu Credit Card Compare to Other Options? The Deserve® Edu Credit Card serves a very specific purpose. It's an excellent card for international students who lack social security numbers or credit histories. This consumer group is often turned down by other credit card issuers—most of whom require all applicants to possess a SSN. Students (both domestic and international) without a SSN. Individuals who already have a U.S. credit score. Students interested in building a credit history. Once you're approved for the Deserve® Edu Credit Card, Deserve will begin reporting your financial account to the credit bureaus. If you continue to make your payments on time, keep your credit utilization low, and keep the account open, you will establish a positive credit history. However, you should tread carefully. If , on the other hand, you don't manage your credit card well and are late on your payments, that behavior will also be reported. And as someone completely new to credit, you should be be aware that these mistakes will carry greater weight now than if you made the same errors after, say, 20 years with an excellent credit history. 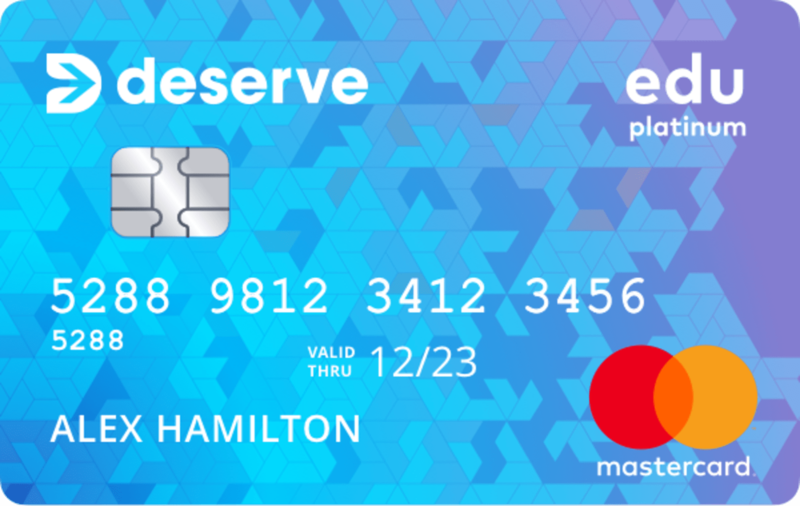 The Deserve® Edu Credit Card goes one step further than helping students without SSNs build a credit history in the United States. Cardholders also get 1% cash back on all their purchases. If you demonstrate financially responsible behavior, you can eventually upgrade to the Deserve® Pro Card which provides even better cash back rewards. Bottom Line: The Deserve® Edu Credit Card is a useful product that helps students without a social security number to receive a credit card, and to build and establish a credit history. The primary benefit of the Deserve® Edu Credit Card is to help students—both domestic and international—establish a credit history. The card doesn't require applicants to submit a social security number, nor do the applicants need to have an established credit file. Instead, Deserve uses alternative data to verify identity and assess creditworthiness. For example, it may use information from your bank accounts to see whether you keep your balance high, whether you often have overdrafts, etc.—all factors that will influence whether you're approved. Once you get either of these cards, your account and activity are reported to the credit bureaus, therefore helping you build and establish a credit profile. The card awards 1% cash back on all purchases. This does not apply to cash advances, balance transfers or any purchases that you return. If you make all your payments on time and are financially responsible, you can eventually graduate to the Deserve® Pro Card. This step-up card also has no annual fee, but provides substantially better cash back reward;. you'll get 3% back on travel and entertainment, 2% back at restaurants, and 1% back on all other purchases. The Deserve® Pro Card also comes with a larger credit limit. You can receive a limit of as much as to $10,000, which is double the maximum limit on the Deserve® Edu Credit Card. Currently, the Deserve® Edu Credit Card comes with a special promotional offer. If you charge a Amazon Prime Student membership to the card, Deserve will reimburse you the fee for one year. That represents a $59 value, which is on par with the value of sign-up bonuses we see from top student credit cards. There are three Deserve® credit cards in total. The only one we haven't yet mentioned is the Deserve® Classic—which is the worst of the bunch. The Deserve® Classic has no cash rewards to speak of. It also requires a SSN to apply, making it a poor choice for both international students and immigrants. How Does the Deserve® Edu Credit Card Compare to Other Options? Before you apply for a credit card, it's worth taking time to evaluate your other options. We compared the Deserve® Edu Credit Card against other student credit card options. The Discover it® Student Cash Back is one of the best student credit cards. We recommend it over the Deserve® Edu Credit Card for most people. The only caveat is that the Discover it® Student Cash Back, like most cards, requires a social security number. It's not a viable option for international students. If that's not an issue for you, then you should apply for the Discover it® Student Cash Back over the Deserve® Edu Credit Card. At its worst, it provides 1% cash back, thus matching the Deserve® Edu Credit Card. Besides that, the Discover it® Student Cash Back also awards up to 5% cash back on up to $1,500 in combined purchases in bonus categories each quarter (activation required). For 2019, the categories include grocery stores (January-March), gas stations, Uber & Lyft (April-June), restaurants (July-September), Amazon.com (October-December). Also, Discover it® Student Cash Back doubles all the cash back you've earned at the end of your first year. Like the Deserve® Edu Credit Card, the Discover it® Student Cash Back reports your activity to the major credit bureaus. That will allow you to build up your credit history over time. 5% cash back on rotating categories, on up to $1,500 in purchases when you activate. Can be used to build your credit history. Discover it® Student Cash Back Review. The Citi Rewards+℠ Student Card is a better option than the Deserve® Edu Credit Card if you make a lot of small purchases. That's because Citi rounds your points to the nearest 10 whenever you make a purchase. For example, if you buy a $2 water bottle, you'll get 10 Citi ThankYou® Points. If you pay $12 for a taxi, you'll receive 20 points. It's easy to see how quickly points can add up if you frequently make small purchases. It's worth noting that the card doesn't charge users an annual fee. Citi Rewards+℠ Student Card Review. Nonresident aliens can apply in-branch with no SSN. 1.5% rewards rate on all purchases. Other Bank of America Student Credit Cards.